The Punisher will once again be split into 3 different lengths so that you can choose the amount of punishment you deserve. The routes have been altered significantly from past years – so make sure you review the GPS files. The C ride will be a shorter (36 mile) version with a paltry 4500 feet of climbing. This route will climb on dirt roads part of the way up Montana Mountain. The descent back down will be on the Arizona Trail. From there you’ll take dirt roads over to Superior, then on to the infamous Telegraph Canyon Road. 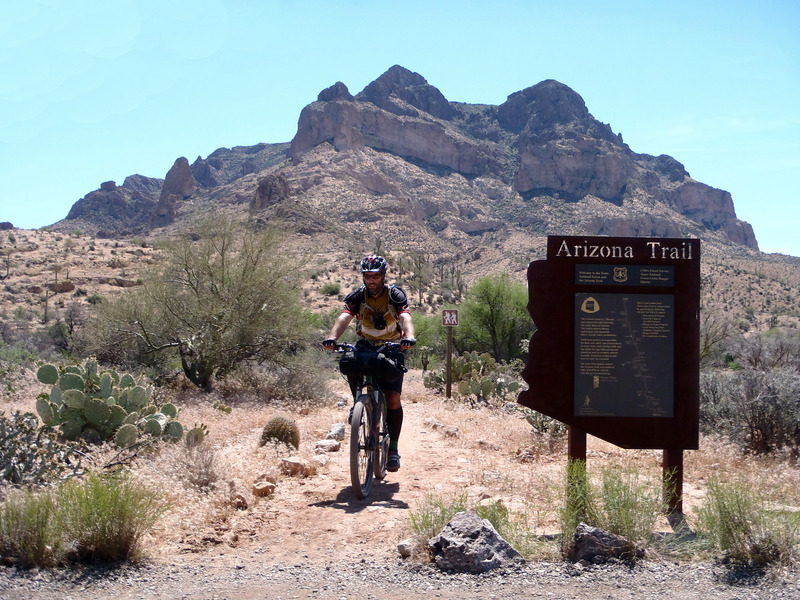 You’ll ride that poor excuse for a dirt road to where it crosses the Arizona Trail, then take the sweet singletrack back to the Picketpost trailhead. The B ride will climb Montana Mountain as in past years. however, this year we’ll use dirt roads on the west side, not the east. The climb is longer, but arguably easier – and definitely more scenic. As before, you’ll ride dirt roads into Superior, where there will be opportunities for water or even a slushy and a hot dog. Then you’ll head south out of town to Telegraph Canyon Road, to AZT, to the finish. The A ride (aka: The Pulverizer) will be slightly shorter this year at 76 miles. Make no mistake, it will still be plenty tough. This year the route will head south on AZT down to the Gila River. You’ll cross the river (good chance to filter water) and start climbing to Florence-Kelvin Highway. You’ll then bomb down that dirt road all the way to Kelvin Bridge. From there it is AZT all the way back to the start. 1. You must have a GPS and know how to use it. There are no trail signs and it will be very easy to get lost. 3. You need to be prepared to be on your bike for 10-15 hours or more. Some VERY fast folks have done this in 10 hours. Expect it to take longer for most everyone else. 4. You must have lights and be comfortable with riding at night in challenging terrain. B and C routes will start with a neutral roll through the first 2 miles of singletrack. Once we hit the dirt road, we’ll gather up – then it’s on! The A route will NOT have a neutral start. The B (58 miles) and C (36 miles) routes will start at 7:30am. The A route (76 miles) will start at 5am. Camping is allowed at the Picketpost trail head. Trailhead has pit toilets, but no water. You will start at the Picketpost trail head off of Route 60 near Superior, Arizona. This is about 60 miles east of Phoenix and about 5 miles west of Superior. If you pass the Boyce Thompson Arboretum, you’ve missed the trailhead turnoff. You can get directions to the start here. In a race of this length and remoteness, water is a concern. Bring as much as you can! We’ve done some scouting and found some possible and some dependable water sources. Water sources are marked (as waypoints) on the GPS files. The AZT from the top of Montana Mountain to where it crosses 650 is choked with catclaw and the trail itself is in pretty bad shape. Therefore, it has been decided that they B route will skip that section. When you get to the top of the mountain where we’d usually go down the AZT, the route will continue on the dirt road and go down the mountain until the first time the AZT crosses that road. From there we’ll be back on the original route. The GPX has been updated – the file is version 2. It is HIGHLY recommended that you bring, and know how to use, a GPS for this race. The Legends of Superior section has lots of areas where it is easy to miss the trail and get off course. Using a GPS and paying attention are the best ways to stay on course and not get lost. GPS files for all three courses can be obtained at the links below. A couple of small changes this year. Circle K has moved so that it is VERY close to where you turn south off of US60. Can you hear the tall cold drinks and junk food calling? Hewitt Station Rd is closed. There is a go-around on FR252 and a small connector to get over to FR172. Bring a chair, beverages, food, whatever. Hang out and watch the folks doing the longer routes come in. Spend some time getting to know the super cool people who share this strange compulsion to push themselves to their limits. Witness the pain and utter exhaustion of anyone who finishes the Pulverizer. Hey John, would that be the “flow of the Beast”?! 6.66cfs is an ominous rate! That ended up being the easiest Gila crossing evah!! RIdeable! !